Sir Francis Drake in Cartagena de Indias 1585. The Battle of Cartagena de Indias (1586) or the Capture of Cartagena de Indias was a military and naval action fought on 9–11 February 1586, of the recently declared Anglo-Spanish War that resulted in the assault and capture by English soldiers and sailors of the Spanish city of Cartagena de Indias governed by Pedro de Bustos on the Spanish Main. The English were led by Francis Drake. The raid was part of his Great Expedition to the Spanish New World. The English soldiers then occupied the city for over two months and captured much booty along with a ransom before departing on 12 April. Governor Don Pedro Fernandez de Busto had been warned from a vessel that had sailed fast from the recently sacked city of Santo Domingo that his city would be next. He decided that all value was to be transported inland, while the city itself was evacuated of all non-combatants. Don Pedro Fernandez called for reinforcements from other nearby settlements and the militia of Cartagena was mustered and defences were prepared. :54 The English fleet after leaving Santo Domingo sailed parallel along the New Granadan coast towards Cartagena. Drake knew that the coast was a treacherous one and a dangerous place to land sailors let alone soldiers. The naval defenses of Cartagena included two well-armed galleys crewed by a total of 300 men under the direct command of Don Pedro Vique y Manrique who also doubled as the governor's military advisor. He was assisted by his two subordinates, Captain Juan de Castaneda in the Santiago and Captain Martin Gonzales in the Ocasión, and a galleass which, although unseaworthy, was anchored in the harbour for support. These galleys would give supporting fire on La Caleta which was covered by the earthworks. :264 On land a stone-built fort; El Boqueron with eight guns was garrisoned by about 200 men under Captain Pedro Mexia Mirabel and guarded the passage to the Inner Harbour. :192 The main defence consisted of a force of up to 570 regulars and militia which protected the city itself (100 of them being pikemen), supported by a troop of 54 mounted lancers under the command of Captain Francisco de Carvajal, and a unit of as many as 300 Indian allies, equipped with bows and poisoned arrows. These were supported by a handful of Spanish regulars who served as officers and instructors. Drake established his headquarters in the house of the wounded Alonso Bravo and he planned to hold the city until he could negotiate a ransom. Before he could do so, however, and despite Drake's orders to avoid looting, the English soldiers ran amok, ransacking houses and churches until Drake and his officers were able to get them under control. Drake then began by demanding ransoms from his prisoners, including Alonso Bravo; the two actually became friends and allowed Bravo to visit his dying wife. Drake's feeling of compassion eventually decided to decrease his ransom to just 600 pesos. On 27 February, Drake called for a council of war to decide what to do with the city. 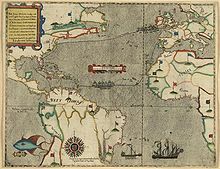 One suggestion was that Cartagena should be held by the English, and turned into a permanent English settlement in the heart of the Spanish New World. :194 However they all agreed that the English crown would not tolerate the huge finance that would be involved. It was agreed that with a fever spreading rapidly and the ransom now completed it was decided to abandon the city as soon as the ransom was collected. The English took whatever remaining goods they could, which could be sold for a profit on the voyage home. He embarked around 500 slaves, took whatever guns he could fit into his ships, leaving Cartagena virtually defenceless. :195 The official plunder was set at 107,000 pesos, while the private plunder was as much as 357,000 'pieces-of-eight' and the value of the guns, church bells and other goods, meant that a respectable haul of 500,000 pesos was acquired. The popular cocktail drink of the mojito has its origins as a result of this raid. With fever coming a problem amongst the English ships Drake wanted a solution. After leaving Cartagena and sailing northwards a small boarding party went ashore on Cuba and came back with ingredients for a medicine which was effective, and so became known as El Draque. On June 9, the Spanish record in a document that when looking for Drake they found evidence that a small English party had landed 5 days earlier on 4 June. This is when they would have gathered the ingredients for the cocktail. ^ a b Kraus, Hans (1970). "Sir Francis Drake: A Pictorial Biography". Loc.gov. Retrieved 8 April 2013. ^ Joy Paige, Sir Francis Drake: Circumnavigator of the Globe and Privateer for Queen Elizabeth. Library of Explorers and Exploration. Rosen Publishing Group. 2002. p. 78. ISBN 978-0-8239-3630-4. Retrieved 8 April 2013. Bradley, Peter T (2000). British Maritime Enterprise in the New World: From the Late 15th to the Mid-18th Century. Edwin Mellen Press Ltd. ISBN 978-0-7734-7866-4. Kelsey, Harry (2012). Sir Francis Drake: The Queen's Pirate. Yale University Press; 1st Ed. ISBN 978-0-300-07182-5. Konstam, Angus (2000). Elizabethan Sea Dogs 1560–1605 (Elite). Osprey. ISBN 978-1-84176-015-5. Jaques, Tony (2006). Dictionary of Battles and Sieges: A Guide to 8500 Battles from Antiquity Through the Twenty-first Century. Greenwood Press. ISBN 978-0-313-33536-5. Marley, David (2005). Historic Cities of the Americas: An Illustrated Encyclopaedia. ABC-CLIO. ISBN 1-57607-027-1. Marley, David (2008). Wars of the Americas: A Chronology of Armed Conflict in the Western Hemisphere. ABC-CLIO. ISBN 978-1-59884-100-8. Sugden, John (2004). Sir Francis Drake. Penguin Books. ISBN 978-1-84413-762-6. Konstam, Angus (2011). The Great Expedition: Sir Francis Drake on the Spanish Main - 1585-86 (Raid). Osprey. ISBN 978-1-84908-245-7. Graham, Winston (1987). Spanish Armadas. Barnes & Noble. ISBN 978-0-88029-168-2. Tucker, Spencer (2012). Almanac of American Military History. ABC-CLIO. ISBN 978-1-59884-530-3. This page was last edited on 29 December 2017, at 14:13 (UTC).